Here is something we are proud of. There are still a lot of users who use android 4.4 on our popular RK3288 devices and can’t perform manual reflashing. For them we made automatic update make your device reflashing itself with upgrading android version. FOLLOWING IFORMATION RELATED TO DEVICES WITH ANDROID 4.4 ONLY! IF YOU ALREADY HAVE ANDROID 5.1.1, YOUR DEVICE IS ALREADY AVAILABLE FOR OTA UPDATES. IF YOU PROSEED OTA UPDATE ON YOUR DEVICE MAKE SURE YOU SAVE ALL DATA, DURING UPDATE DEVICE WILL PERFORM FACTORY RESET AND ERASE DEVICE MEMORY. IF YOUR DEVICES RUN DUALBOOT FIRMWARE, AFTHER UPDATE ONLY ANDROID 5.1.1 WILL BE INSTALLED ON YOUR DEVICE. During next couple of days, Ugoos devices based on Rockchip 3288 with Android 4.4 will display information about new update. 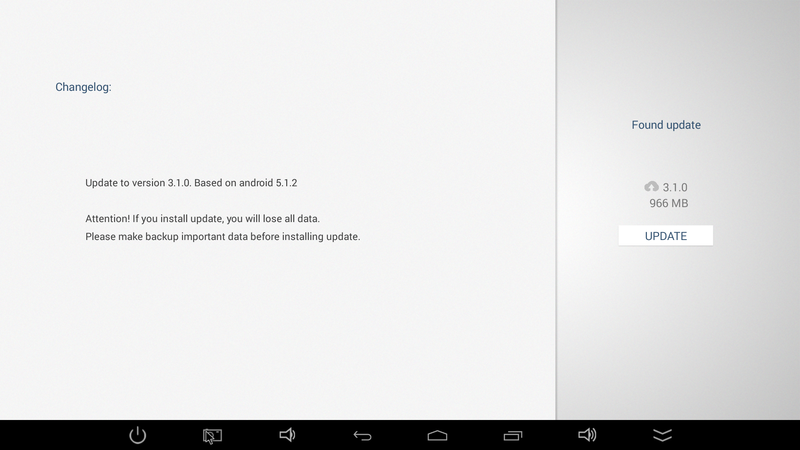 System will show a new update version 2.2.1 – still Android 4.4, but with new OTA mechanism. Next step will be update to 3.1.0 version, make sure you save all your data before further actions. After installation, you will get “clean” system, so you need login your account again and continue using your device.